Vin had never seen a storm like this. She was used to a dim sun hanging in a soot-filled sky. This storm was on a completely different scale. She clung to a metal flagpole high on the city wall, all she could see for miles was the massive storm. It would hit the city soon. If the reports were true, nothing would survive. Debris kicked up as the high winds pulverized the nearby town. Her tin-enhanced eyes picked up movement near the top of the storm wall. Is that a Mistborn? Kaladin drew in a deep breath as he rode the storm. This land was different than Roshar. It was more barren than the Shattered Plains. He hadn’t found what the Storm Father was looking for. From his vantage point, it was clear this land needed cleansing. Vin couldn’t stand by any longer. She had to do something. The man flying at the front of the storm pulsed in her vision. She flared her metals and launched herself toward the massive wall of water. Kaladin watched the grey shape grow larger as it flew toward him. Syl flew around him in a wide blue arc. Could this be the cause of the Storm Father’s tempest? He shifted the spear in hands and Lashed himself toward the newcomer. Vin Pulled on the man’s weapon and he changed direction in mid air. She’d never seen an Allomancer move like that. She could feel metal in the debris below the storm. She latched onto something, a cooking pot maybe, and tore off after him. Kaladin watched the girl give chase. It didn’t seem that she was drawing in Stormlight. How could she move like that? She had nearly pulled his spear out of his hands. The storm raged beneath them as they flew along the edge. 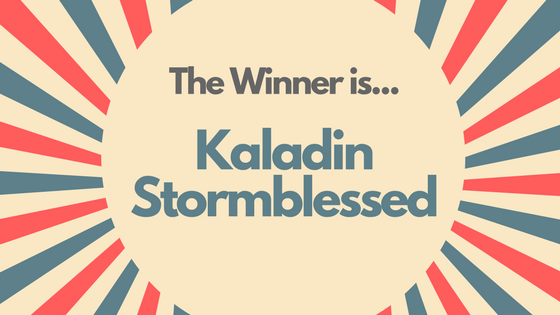 Kaladin could feel Stormlight pulsing from within the squall. It would hit the city soon. Maybe once it fell, the Storm Father’s rage would subside. But first he had to deal with the storm trash. Stormlight coursed through his body. He shifted along the winds and lashed his spear at the girl who trailed him. She dodged over it, and flew straight at him, shimmering daggers in her hand. They locked together, striking out as they plummeted through the sky. Two titans in their element. Two masters of the winds. Two gods battling for the skies. What a fight! Can’t you just imagine these two swirling among the clouds? 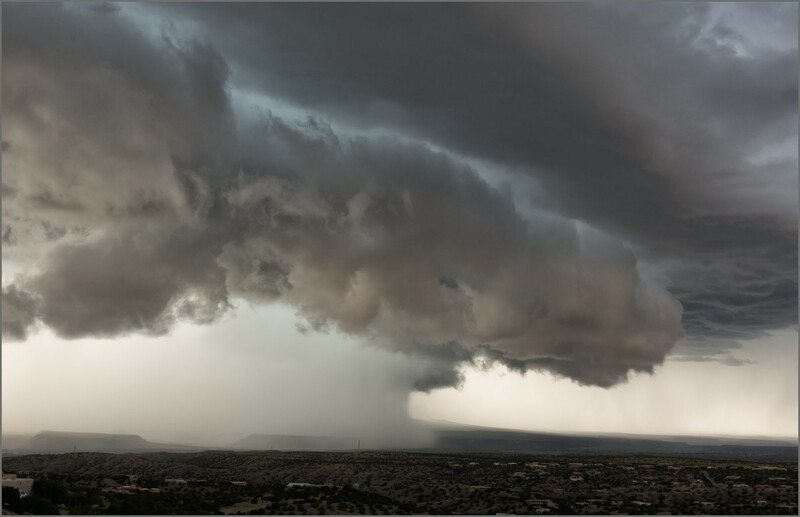 A massive storm front at their backs as they battle in the sky! I didn’t want to vote on this one, but I’m glad Kaladin won the day. I gotta say, #TeamStormlight for the win. This was a fun few weeks. The tournament was great, and thank you so much to everyone who voted. In total, we had just under 300 votes! I literally could not have done this without you. I learned a lot, and I have a couple different things to try for the next time. This week I’m traveling to South Dakota to visit my dad who lives in the Black Hills less than an hour from Mt Rushmore. It’s a thirteen hour drive with my wife, 7 year old, 5 year old, and 11 month old. Pray for me. But really, I’m excited for this trip. Not only do I get to see my dad who I haven’t seen in three years, but I get to road trip with my favorite people. I’ll be binge reading the Wingfeather Saga, and Failstate on the drive. My wife just started The Blood Rose Rebellion and The Evaporation of Sofi Snow. The rest will be engulfed in Pokemon, My Little Ponies, and hopefully screaming at the top of her lungs. Gretchen has been rocking out movie and book reviews, I’m hoping to get a few out myself over the next month. Thanks for being awesome readers! Expect more adventure in the coming months! Did your favorite claim the title? Let me know in the comments, or catch me on Facebook. Are you #teamallomancy or #teamstormlight? It goes without saying, but Vin, Kaladin and the worlds they’re from are the work of the great Brandon Sanderson. Check out his books, and dive into these characters. There’s a reason these two made the final round.